Staying at a Juhu beach hotel right on the oceanfront is the perfect solution for escaping the hustle and bustle of Mumbai. You'll feel secluded from the city at this upmarket suburban location. An added bonus is that you'll be relatively close to the airport. These top hotels in Juhu are the pick of the bunch for a relaxing beachside vacation, for all budgets. (Here's a tip: if you're going to be in Mumbai for the Ganesh Chaturthi festival, you'll be in the heart of the action where the idols are immersed in the ocean at Juhu Beach). Thinking of splurging? You can't pass up the JW Marriott. Not only is it one of the best luxury hotels in Mumbai, but it's also centrally located in the Juhu Tara Road shopping area and has an extensive range of facilities. These include one of Mumbai's top luxury spas, fitness center, four restaurants, a bar, and bakery. The Lotus Cafe is renowned for its extensive buffets. Oh, and there's a huge oceanfront swimming pool and garden with direct beach access too. It's imposing, recently refurbished, a landmark hotel with 355 guest rooms. Everyone from Bollywood stars to vacationing families can be found there. The Novotel opened in 2009 after a complete renovation (it used to be the old Holiday Inn), making it a relatively new hotel on Juhu beach. Further upgrade works are currently being undertaken to update the guest rooms. The hotel is located at the quieter northern end of the beach and has a fabulous outlook across the water, which is ideally enjoyed alfresco from the chic sea lounge. It's one of the best places for a sundowner in Mumbai -- and there are happy hours too! Four restaurants and a French patisserie provide plenty of options for dining. The hotel has also jumped on the Sunday brunch bandwagon and offers an enticing all-inclusive poolside Sunday brunch, with an eclectic menu and unlimited alcohol. There are 203 rooms and suites, some with sea views. Traveling on a budget? 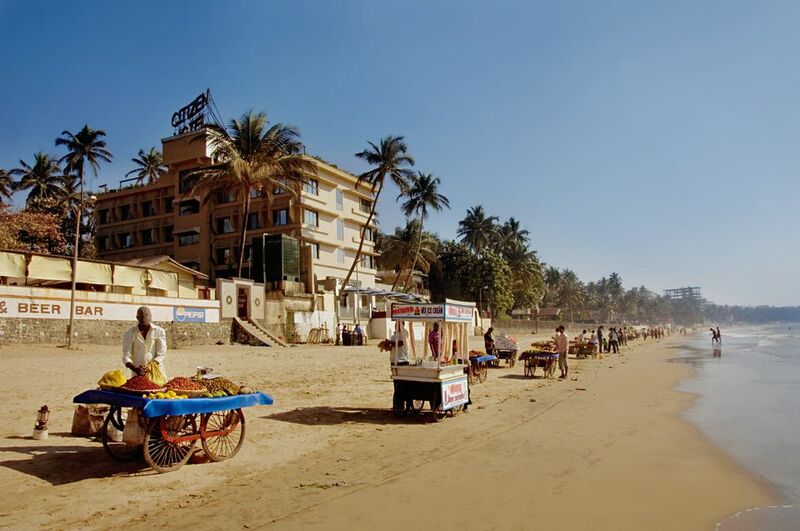 Fortunately, you don't have to miss out on staying on Juhu Beach. The Citizen Hotel is well positioned on the main strip. It's a small, rather quaint vintage hotel with 45 rooms -- and all of them have a sea view! The executive rooms have a partial view, while the deluxe rooms have a full view and a refreshing sea breeze. There's also a beachfront restaurant and bar, and atmospheric open-air seaside patio. The main drawbacks: the guest rooms are small and there's no swimming pool. Dating back to 1962, the Sun N Sand hotel was the first luxury beachfront hotel in Mumbai. It's situated right next to the Novotel but is a smaller property with 120 guest rooms. If you don't mind the fact that the rooms lack modern amenities and contemporary decor, you're likely to enjoy your stay there -- particularly if you choose one of the spacious ocean view rooms (which cost a very little extra). A hotel is a popular place for weddings. Fortunately, the rooms are effectively soundproofed though. Facilities include two restaurants, a 24-hour coffee shop, poolside cafe, a lounge bar, and a fitness center. Great service and friendly staff have made the hotel a long-term favorite with guests. It also has a reasonably priced Sunday brunch. The Sea Princess is situated at the far southern end of Juhu beach. This luxury hotel was established in 1987 and recently renovated to give it a funkier current look. There are 111 guest rooms and most have a sea view. Those who love the nightlife will appreciate the fact that the hotel houses a spiffy new nightclub. Tsuki (meaning "moon" in Japanese) opened in 2018 and is spread over 6,000 square feet and two levels. Dress to impress! What's also unusual about this hotel is that it has a meditation room. The hotel's stylish Beach Club is an ideal place to relax by the swimming pool and ocean. There's a fitness center, spa, and two restaurants as well. Airport shuttle and free wireless Internet are provided. Step out of the hotel and you'll be in the center of carnival-like Juhu beach. The Ramada Plaza Palm Grove is situated on the busy main part of the beach, right next to the rows of snack stalls. There are numerous restaurants and bars in the vicinity if you'd prefer not to eat street food. Similar to the Sun N Sand, the hotel is an older one that's been well maintained. Its retro rooms could do with updating but they're clean and comfortable. Just don't expect five-star luxury and you won't be disappointed! Facilities include a beauty salon, fitness center, book shop, and handicraft store. Unfortunately, the hotel doesn't have direct beach access, which may be a negative for some. Pssst! Private member's club Soho House opened on Juhu Beach in Mumbai in 2018. For those not in the know, Soho House was founded in London in 1995 for people working in creative industries. Since then it has expanded to 22 locations across the world, mostly in Europe and North America. The Mumbai outpost (the first in Asia) is a pristine, white 10-story former apartment building that's south of the Hotel Sea Princess. Its 38 guest rooms, referred to as bedrooms, come in various sizes from "small" to "playroom". Their refined Indian-inspired decor features neutral tones and blocks print textiles. The rooms can be booked by non-members, subject to availability. Perks include access to the club, restaurants, and gym.